Jazeman Jaafar finished with third, fifth and tenth place finishes in Austria this weekend at the F3 Euro Series in Red Bull Ring Spielberg, continuing his unbroken run of securing a podium at every F3 event he’s competed in this season. The F3 Euro Series round at Red Bull Ring Spielberg was the second appearance of Jaafar in this championship, with the young Malaysian contesting selected rounds to complement his British F3 campaign and provide him with more racing opportunities. Jaafar was making his first visit to the Austrian race track, a facility which until recently hosted Formula 1 championship races. In the pre-event tests he ran consistently in the top ten, finishing ninth quickest. In the qualifying session Jaafar posted laps which put him sixth for the first race and ninth for the third race, with the second semi-reverse race grid being determined from the results of the first race. In the first race, Jaafar made a good start from his sixth place grid slot and settled into a good pace after battling with team mate Carlos Sainz. With two drivers ahead given drive-through penalty for yellow flag infringements Jaafar gained track position. He ran in fourth place for much of the race distance, until in the closing stages team mate Sainz, spun off ahead of him to put Jaafar into a podium spot. 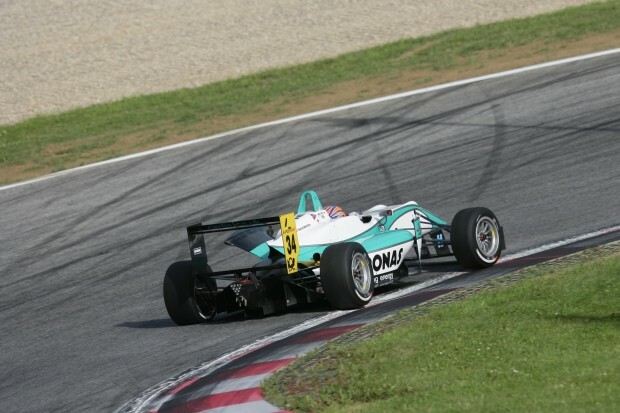 The PETRONAS-supported driver crossed the finishing line third to take his second podium place in the F3 Euro Series. Starting sixth for the second race Jaafar made another clean start and was quickly challenging to move up the field. The 13-lap sprint distance gives little time for improvement and Jaafar produced a string of consistent, strong laps to take the chequered flag in fifth position. In the final race of the weekend Jaafar lined up in ninth place and made a lightning start. As it turned out, the stewards deemed that his start was a touch too quick, imposing on him a drive-through penalty for a jump start. Jaafar served his penalty in the early stages of the race, returning to the track in 16th place. The 19-year-old driver took up the challenge of improving on his track position and over the course of the race distance resolutely worked his way forward to secure a top ten finish by the end of the race. The Carlin driver has little time to relax as he returns to the UK to race in the fourth round of the British F3 International Series which takes place at Rockingham circuit in Corby, UK next weekend.